Leave behind life's distractions and retreat to the beautiful French countryside. Standing on 1600 m of open land with a gated garden surrounded by rolling countryside, there are many spots in the Le Verger to write, read and find peace. During your retreat or course you’ll be accommodated in your own simple but comfortable room with a desk and lamp. Subject to availability, retreaters may share accommodation in the main house with another writer or an accompanying partner. Retreaters may also stay in The Piggery or in one of the beautful cabins with decks. There is wifi in all the accommodation. The Main House and The Piggery are also available for holiday rentals, with the two decked cabins as additional accommodation to either rental, if required. For booking enquiries please use the form at the bottom of the page. 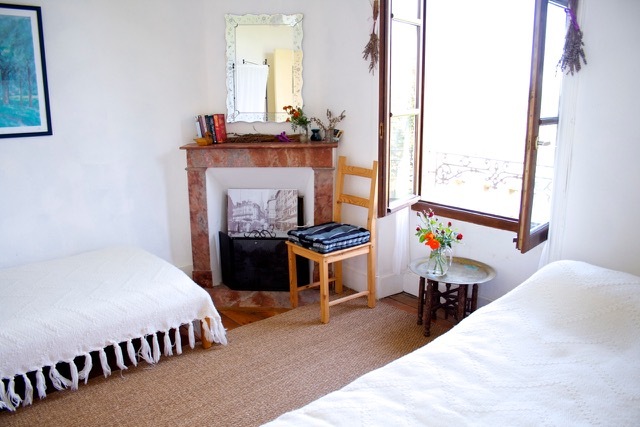 Le Verger is an authentic stone maison de campagne. It's generously sized two attic bedrooms (one twin and one double) share a bathroom. The first floor has two bright bedrooms (a twin and double) with shared bathroom. The ground floor comprises a comfortable living room, farmhouse style kitchen / diner, leading out to a large (6m x 6m) covered deck suitable for dining, yoga and other group activities. ‘The Piggery’, a converted gite in the grounds, is suitable for two (or more): it has a large open mezzanine space upstairs (4m x 6m) with double bed / twin bed configuration. Downstairs (5m x 6m’) is double sofa bed accommodation separated by curtains. It has its own kitchen, bathroom and terrace. Two Writer’s Cabins (3 x 3.5m and 3 x 3 m) both with their own deck, provide ‘rustic’ but very comfortable single or twin bedded accommodation (occupants use main house bathroom). There is also the 'budget' option of one large (1.60 m x 2,90 m) stand-up tent for one person. Bedding and electric light is provided. We had an incredible week made all the better by such a lovely base. the property is full of character and has an owner who ensures everything is just right for you.